I don’t know about you, but I think that generosity is such an attractive virtue, so appealing, so inspiring. 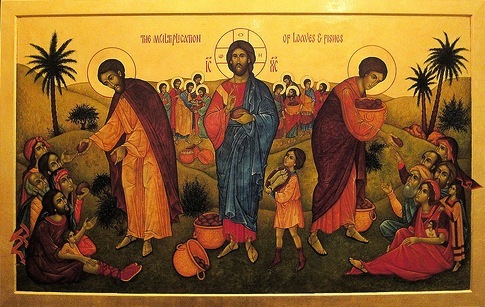 The Gospel reading today with the miracle of the multiplication of the five loaves and two fish, shows the generosity of a little boy, and then, the inexhaustible generosity of God, who not only multiplies the gift, but for good measure, leaves some to spare! As Jesus in another part of the Gospels pulls a child aside as an example of simplicity and humility, it is again a child who displays a generosity that the rest of those present in the crowd seem to lack. He offers the little that he has, all that he has, and with wonder watches Jesus multiply it. Obviously in this Gospel there are so many different meanings on so many different levels. Of course this is a prefigurement of the Eucharist, and here Jesus is demonstrating His power over creation. But perhaps for today think also on that virtue of generosity: Of my generosity of heart towards God, and God’s generosity to me in return. What mighty things Our Lord wants to, waits to, accomplish in us, through us, if only we let Him. He doesn’t want us to be embarrassed by the littleness of our offering. He can make it into something great! All He needs is our generosity of heart, just like that little child so long ago. This entry was posted in Jesus and tagged generosity, Jesus, multiplication of the loaves and fishes by srgracemarie. Bookmark the permalink.